I remember first coming across this — what might be described as the first ever opera — on a Turnabout LP (TV34439S); do you remember that label? It was performed in about 15 minutes flat by The Cambridge Consort directed by Joel Cohen. So I decided to buy a score from a London music shop. What turned up shocked me even then. It was a version for five singers with a big, fat piano accompaniment, rich harmonies and RH octave doublings arranged by Julien Tiersot (1857-1936). It was described as an ‘Opéra–Comique’ and all in an often quite Romantic style. Any hopes I had of putting the piece on were scuppered thinking that that was all I would get. The Studio der Frühen Musik recorded the piece for Telefunken in 1968 and zipped through the songs in thirteen minutes. Many years later - in 2003 in fact - I spotted this version on Teldec in an excellent CD shop in Caen in Normandy (the French have such super classical CD shops still) and have played it quite regularly. That doesn’t mean that I find it completely successful. I was pleased therefore to discover a version on Naxos a year later by Tonus Peregrinus (8.557337) (review ~ review). This was a real dramatized version with ‘noises off’ like horses hooves. It also takes about an hour to play. I prefer the quality of singing on their disc. It is less harsh than Micrologus who attempt what I might call a sort of folksy style. They include the spoken text in French - fine - but over it and after it we are given an English translation. This is rather curious and after a while irritating especially the Etonesque impersonations. So Micrologus have re-launched their 2003 recording - originally released on Zig Zag Territoires - in a delightful cardboard packaging adorned with manuscript illustrations. It's much more interestingly presented than the original. I also like the fact that the texts, which although printed in a smaller font, are now, side by side in the booklet and not, as they were, separated into languages. One of the essays is new but the documentation is slightly less detailed. There are also some attractive photographs of the live performance. ‘Le Jeu’ or game, was popular for another two hundred or more years and was probably composed in Naples c.1275 for the French court residing there. Interestingly the Robin Hood legends, often set during the reign of Richard I (c.1195) were becoming increasingly popular during this period as well as further into the Middle Ages. The popularity of the piece may well have been because the melodies are so memorable and pleasing. 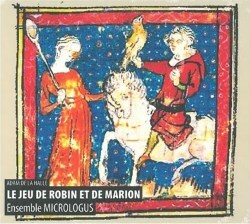 It's often thought that Adam utilised already known folk melodies but he also used them in various quite sophisticated three-part Robin and Marion motets. These are recorded here - and by Tonus Peregrinus - and are interspersed throughout. Other, anonymous composers at the time - and later - used the tunes in various polytextual motets and chansons. Adam’s surviving output is quite considerable, almost forty pieces, and he may well also have written the words for this piece. The somewhat thin plot, set in May time, revolves around how Marion, in love with Robin is threatened by the crusader knight Aubert who wants to abduct her. At first Robin's attempts to save her are foiled as he is beaten up by Aubert. Robin is rescued by his friends but Marion escapes the knight’s clutches and in the end the lovers marry with singing and dancing. To spin out the ‘experience’ of this first music-drama, semi-staged in this recording, Micrologus have also added ‘estampies’ for instruments alone including the Breton pipes. These sound rather overpowering and may not appeal, and if you have heard them as I have in Brittany, say at the Music Festival at Lorient, you will know what I mean. These dances are originally from a Royal manuscript compiled in the thirteenth century. Some are clever improvisations around Adam’s melodies and serve to break up and link the scenes. These dances were surely a part of the original music-drama anyway. The group consists of ten performers including four singers taking the roles of Marion, Robin, Gautier and an extra for the motets. Tonus Peregrinus utilise all eleven characters but most are simply speaking parts. At the end of listening to Micrologus’s version however, I still feel, a sense of fun and of enjoyment, which, after all, is what it's all about. OK I’m not mad on some of the singing and some of the instrumental choices. They seem uncertain as to whether they are recreating an outdoor Mayday performance or one for a court indoors. All that said, the way things stand, this is the version I prefer. Even so there is definitely room in the catalogue for another ensemble to test the de la Halle waters.